elizabethan | Oh, The Glamourous Life! With the recent warm weather and soaking rain, my herb garden has had an autumn renaissance. The sorrel in particular (normally a spring plant) was looking remarkably healthy. Having a rare night off, I decided to cook a 16th century dish for dinner and use it up all the sorrel before the frost hits. Sorrel has a delightful lemony flavor and is most often used in soup in several Eastern European cuisines. It’s hard to find, which is why I grow it, and it’s impossible to preserve, so when you have it, use it. Strayne your broth into a pipkin, & put in your Chickins, and skumme them as cleane as you can, and put in a peece of butter, and a good deale of Sorell, and so let them boyle, and put in all manner of spices, and a lyttle veriuyce pycke, and a fewe Barberies, and cutte a Lemman in peeces, and scrape a little Suger uppon them, and laye them vppon the Chickins when you serue them vp, and lay soppes vpon the dish. I started with two split chicken breasts. In the past I’ve used a game hen, but there weren’t any at the market. You want to use meat on the bone for the best flavor. I put the breasts in a small pot (aka a pipkin) in which they just fit and added chicken broth to cover, maybe two cups. No scumming needed. 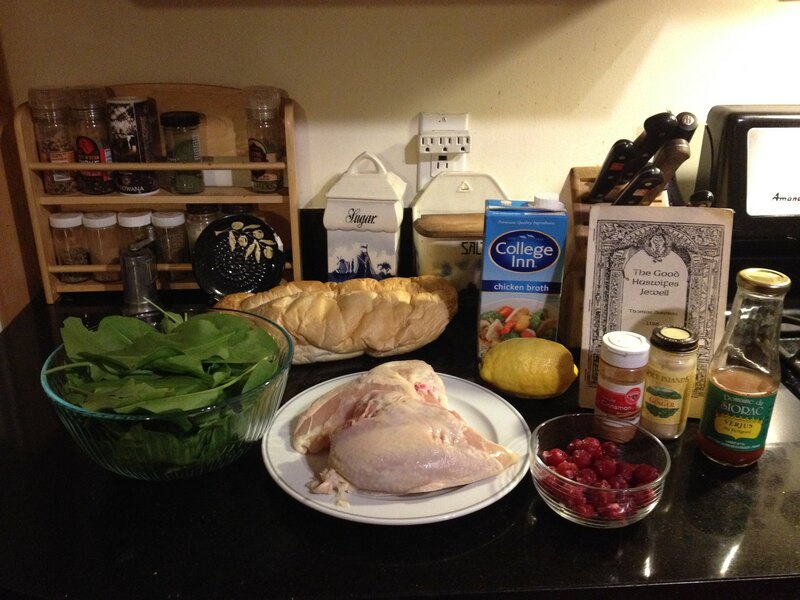 I omitted the butter, because modern chickens are fattier than their Elizabethan counterparts. Then I gathered all the sorrel, which turned out to be about 3 oz, and chopped it finely. I added it to the bird & broth. Then I let it simmer until the chicken was cooked through. Then I removed the chicken and I added 1 tsp. cinnamon and 1/2 tsp. ginger to the broth because those were the spices called for in “To dresse Chickins upon Sorrell sops” from A.W.’s A Book of Cookrye (1584) plus a little salt and pepper. I’m unclear what “veriuyce pycke” means. Maggie Black, in her modernization, had something like “and a little verjuice. Pick a few barberries”, but that just didn’t seem right. I just ignored “pycke” for now. Verjuice is made from juice of unripe grapes and it’s a little like vinegar, but milder and with a hint of sweetness. I added 1/4 cup. Next, the barberries. I had some dried barberries a friend gave me, but when I got the box out of the pantry, I discovered the berries, still tightly sealed up, were crawling with pantry moth larvae. Eeeewwww! Out to the trash those went in a hurry! 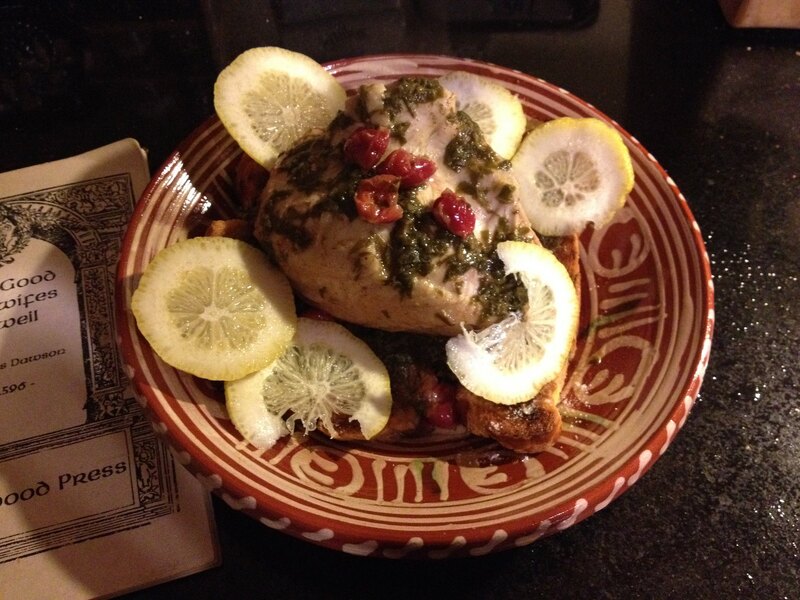 Jerusalem: A Cookbook recommended substituting dried sour cherries or dried currants refreshed in lemon juice. However, references in Elinor Fettiplace’s Receipt Book and Food & Drink in Britain both suggested that barberries were used fresh. I thawed some of our sour cherries and threw them into the broth. I let the broth cook down for a while and then put the chicken back in for a bit. Soppes, also called sippets, are slices of stale bread that are put in the bottom of a dish to soak up the broth or juice or gravy. They’re a holdover from the medieval days of trenchers — a slab of sturdy bread used instead of a plate. You want the bread to be really hard or it will get gummy quickly. I didn’t have any stale bread, so I cut some slices of Italian bread and toasted them. Those went in the bottom of the dish. I put one of the breasts and a few ladles of broth on top. Then I cut about half a lemon into thin slices, sprinkled them lightly with sugar and laid them all over the bird. I’ll probably cut the remaining breast into pieces and serve it in the broth as soup. This recipe is a little rougher than most as I usually wing it, depending on how much sorrel is growing and how much broth it takes to cover the meat, and I didn’t time anything. Consider everything approximate and do as you see fit. That’s the beauty of historic recipes. Simmer chicken and sorrel in broth until chicken is done (the time will depend on the size and cut of your meat). Remove chicken. Add fruit, spices, and verjuice. Simmer until flavors combine and broth reduces somewhat. Add the chicken back into the broth to warm it up. Place slices of stale or toasted bread with the crusts trimmed in a dish. Put the chicken on top and pour some of the broth over. Slice a lemon thinly and garnish chicken. Sprinkle some sugar on the lemon slices. Serve immediately. In the previous historic recipe, I mentioned jumbles, a kind of Elizabethan cookie. Some think the name comes from the Latin word for “twin”, gemellus, which hints that they were shaped with two loops. Here’s how you make them. From The second part of the good hus-wiues iewell by Thomas Dawson (1597). Take twenty Egges and put them in a pot, both the yolks & the white, beat them wel, then take a pound of beaten suger and put to them, and stirre them wel together, then put to it a quarter of a peck of flower, and make a hard paste thereof; and then with Aniseede moulde it well, and make it in little rowles, beeing long, and tye them in knots, and wet the ends in Rosewater, then put them in a pan of seething water, but euen in one waum, then take them out with a Skimmer and lay them in a cloth to drie, this being doon, lay them in a tart panne, the bottom beeing oyled, then put them into a temperat Ouen for one howre, turning them often in the Ouen. I didn’t need a hundred jumbles, so I cut the recipe way down. The first thing to note is that until the 20th century eggs were on the small size, so a good rule of thumb is to cut the number of eggs in half if you’re using standard supermarket eggs. A quarter of a peck of flour is about 3 1/2 pounds. Despite the whole wheat flour in the picture, I used white flour — it was in a less photogenic container. Beat the eggs very well — they’re the only leavening in the dough. Add the sugar, then the flour and the anise seed. 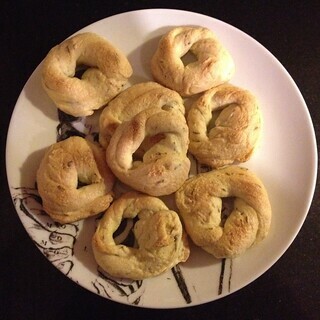 When I first made these many years ago, I used anise, which a lot of people (like Scratch) really don’t like. This time I used caraway. Not as historically accurate, but more likely to be eaten. Then divide the dough up — I split it into 8 parts — and make it into long snakes. Tie them into knot-like shapes. I’ve done actual knots, but this time I twisted them into circles. Pretzel shapes would be okay too. The recipe says to wet the ends with rosewater and I’ve done that. I find it adds no discernible flavor, so I skipped it this time. Now the fun part. Drop your jumbles into a pot of simmering water, a couple at a time. You don’t want to crowd them. They’ll sink to the bottom. After a couple of minutes, poke them with a spoon, so they don’t stick to the bottom. When they float, they’re done. Scoop them out of the water with a slotted spoon or similar and place the jumbles on a clean towel on top of a cooling rack. After they’ve dried for a few minutes, put them on a greased cookie sheet (I use a silicone baking mat — I love those things) and bake at 350F for 30 minutes, turning them over half way through. Why not bake for an hour, like the recipe says? Elizabethan ovens worked with retained heat — you’d build a fire in the oven and when the bricks were hot enough, you’d pull all the coals and stuff out, swab the oven floor all down with water (you don’t want ash on your bread plus it makes steam which contributes to a really nice crust), and put in the stuff that baked at the highest heat first and as the oven cooled you’d swap in the things that needed a lower temperature. Trying to mimic the gradually falling temperatures is a pain, so I bake for less time at a constant temperature. Let the jumbles cool on a rack. They will be hard on the outside (good for dipping!) and chewy on the inside, kind of like a tiny sweet bagel. Beat eggs very well. Blend in sugar. Add seeds and flour. You should have a stiff dough. Divide into 8 pieces. Roll each piece into a rope and tie into knots or twist into rings. Carefully place each jumble in a pot of simmering water. After a moment or two, nudge them with a spoon so they don’t stick to the bottom. When they float, remove with a slotted spoon and allow to dry on a towel. Place on a greased cookie sheet and bake in a preheated oven at 350F for 30 minutes, turning each jumble over after 15 minutes. Let cool on a rack. Please vote for The Boston Babydolls every day! To celebrate a successful run of The Bod of Avon, we’re having a wrap party at Stately Babydoll Manor. Scratch has promised authentic Elizabethan delicacies for the guests. This is not as crazy as it sounds. You know from my writings here that I am a bit of a culinary historian with an interest in mid-century cuisine. But I also do research into Renaissance cooking, mostly Elizabethan England, and Scratch dabbles a bit too. Grind together salt and saffron5. Simmer together water & oil. When boiling, remove from heat and beat in flour, salt & saffron6. Keep beating. Really. It will turn into a soft dough. Let the dough cool. Chop fruit finely and mix in the spices. 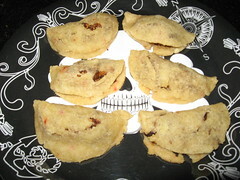 Place a spoonful of fruit filling on half of a round of dough, fold the other half over & pinch shut. They’re supposed to look like peapods, so you can curve them a little into shape. The dough might crack a bit, but that’s okay. You have two options for cooking. You can fry them in oil, like the recipe says. Make sure the oil is quite hot because the dough is like a little sponge. Serve these hot. Or you can (less authentic, but healthier) bake them on a parchment-lined baking sheet at 350°F for 25-30 minutes until golden. These will keep longer than the fried version. Makes about a baker’s dozen. 1 A “Peascod” is a peapod. A “codpiece” is something else entirely. Even if they look similar. 2 In the 16th century Lent meant no meat, no dairy, no eggs — basically vegan, plus fish. There’s also a “flesh day” version of this recipe with meat, butter, and eggs. 3Mace isn’t that common a spice these days. 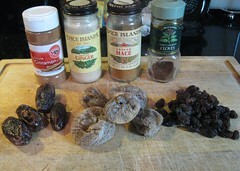 If you don’t have any in your spice cabinet, you could substitute a little nutmeg. Cinnamon, ginger, nutmeg, and clove are the classic quartet of Elizabethan spice. There’s even a little song. 4I use a mixture of flours, based on the researches of Marian Walke, to approximate the flour of the time: 3/4 c. white flour, 2 1/2 Tbs. cake flour, 1 Tbs. 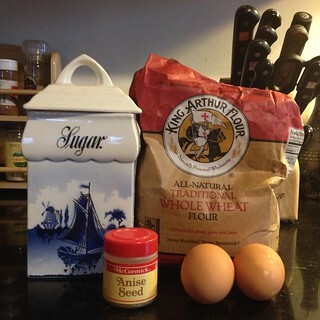 wheat flour, 1 1/2 tsp. rye flour. You don’t have to be this compulsive. 5 I do this with a mortar & pestle. The salt helps pulverize the saffron threads for even distribution. I did this hastily (because I was trying to cook & take photos) and ended up with little orange splotches in my dough instead of a lovely golden tint. 6 This is essentially choux pastry — like cream puffs or eclairs — without the butter & eggs. 7 A biscuit cutter works great for this.